Below, you will find a discription of LED Door Handle combo pack & each of the LED color changing products that are included in pack. This combo pack is your basic "Starters kit". Once you've got a 2.1M color Digital control box installed on your vehicle, you can then plug into the control box any other color changing products sold on this website, or from your local authorized Plasmaglow Dealer. 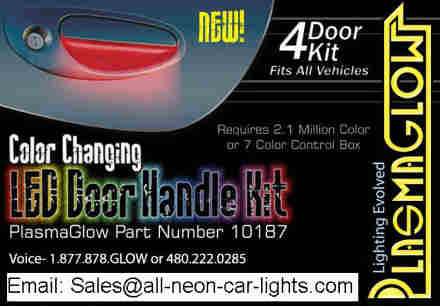 Create Glow where it's never been before with PlasmaGlow's Color changing LED Door Handle Kit! This set of specially designed micro-LED panels install under your door handle, providing an ultra-bright, color changing glow in an eye catching place. Also good for finding the "Key-Hole" late at night! High power micro-LEDs are small and efficient, leaving them cool to the touch and out of the way! Fits any vehicle. 4 Door kit, comes with all required installation instructions and hardware for mounting. If you are a professional looking for the highest quality LED Door handle kits, look no further than the Color Changing LED Door handle kit. The 2.1 Million color LED Digital control box is REQUIRED in order to operate the color changing door handle kit above and features 14 LED functions, 11 speeds, and the ability to change the color of your undercar LED kit or any other color changing Glow stick tubes upto 2.1 Million times with the push of a button from inside your car. Using the 2.1m color LED Digital control box, you can stay on one color or automatically cycle through 2.1 million different colors. * Competition-style control, and the reliability and benefits of LED light technology. The 2.1m color LED Digital control box is a must have for the serious car lighting enthusiast. $199.00USD On Special! Hurry! This week only. Add the LED Door Handle Combo to your Cart for $199.00USD. LED Door Handle Combo Pack - Back to Home Page.